In a blender, combine frozen pineapple, 1/2 cup of sugar, mint, and 1/2 teaspoon vanilla. Add 1/2-1 cup of sparkling water and blend until pureed. Add more sparkling water, as needed, to make the slushie soft enough to be sipped through a straw. Pour into the bottom of four small mason jars. Place frozen watermelon, remaining sugar, remaining vanilla, and lemon juice in blender. Add 2 cups of sparkling water and blend until pureed. Add more sparkling water, as needed, to make the slushy soft enough to be sipped out of a straw. Spoon watermelon slushy on top of the pineapple-mint slushy to create a watermelon-esque red and green slushy. Serve immediately and enjoy! 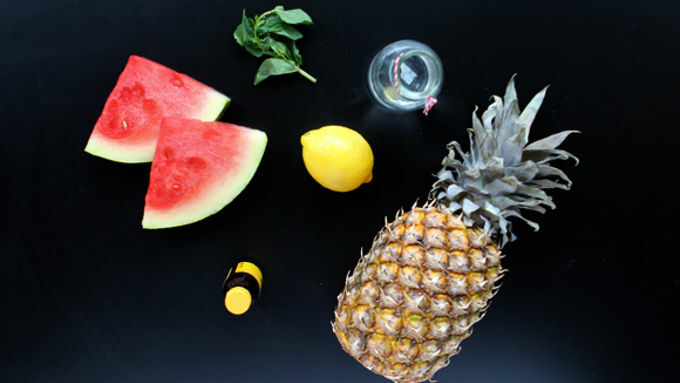 Summertime sippers don't have to be boozy! 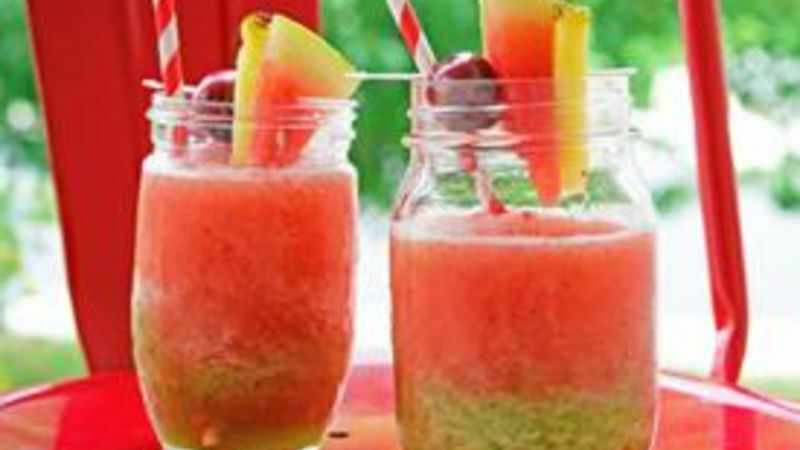 Get your mocktail on with this Watermelon Slushie! Here's the thing. I want your life to be happy. No, I neeeed your life to be happy. And unlike those other bloggers out there who just say things to get you to taste their really awesome food, I'm not just full of hot air. No way. I need your life to be happy so much that I'm here to deliver. Pull out the twisty straw. 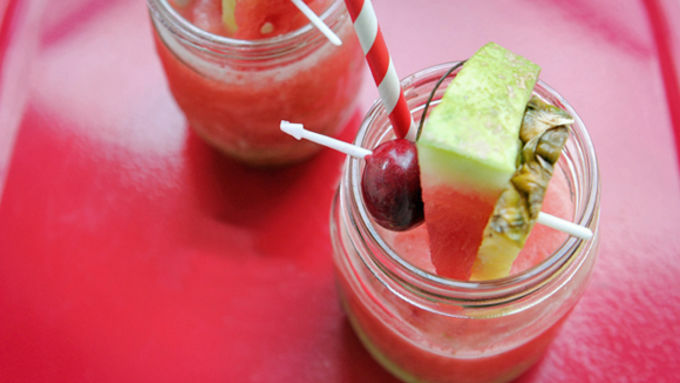 Get ready to sip your face into this cool Watermelon Slushie. The bottom of this two-layer sipper is all minty pineapply goodness. The top is a layer of watermelony joy. Are you feeling the love? Are you getting the happy gene? Because, if not, we're two seconds away from IV'ing this into your arm and getting this slushy going right into your bloodstream. Pure ingredients. Simple instructions. Life really can be this happy. Start sipping.